Does TUI have too much influence on the ski market? While tour operators are relieved at the recent heavy snow in the Alps, the early signs are that this is going to be another poor year for the industry, with a fourth consecutive fall in the total size of the market. Evidently the economy is still in a poor state, and consumer confidence is low. And unfortunately, this means that to sell skiing holidays, companies have to offer discounts from brochure price. This season some companies tried to stimulate demand in the autumn by discounting early – in the form of early booking discounts, lift pass promotions and other special offers. With a 40% share in the ski market, once TUI (the group that owns Crystal Holidays, Thomson and First Choice) start discounting their holidays, many ski companies complain that they simply have no choice but to discount as well. At Skipedia, we are always interested in market drivers and market trends. We wondered: does TUI have too much influence on the ski market? The UK’s largest ski company, Crystal Holidays, was acquired by Thomson in 1998, which itself was acquired by the German company TUI in 2000. In 2007, TUI bought First Choice Holidays. According to their own industry report, the group took over 200,000 on ski holiday packages in 2010/11. 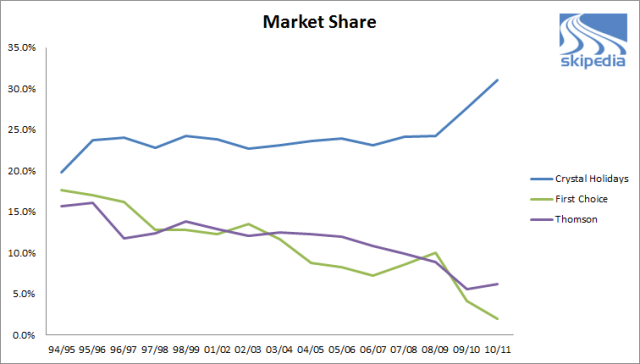 The graph below shows how during the period since 1995, Crystal Holidays have steadily increased their market share from 19.8% to 31.1% – widening the gap with their competitors, especially since 2007. The simultaneous decline in the market share of Thomson and First Choice indicates TUI’s strategy of supporting the market leader at the cost of other brands. 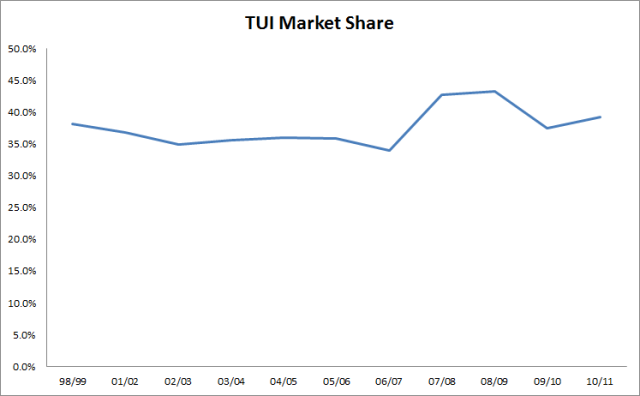 However, the graph below shows that while Crystal may have become more dominant, the TUI group as a whole has not. In the 11 years since Crystal and Thomson joined forces the combined TUI market share has gone as high as 43% (in 2008/09), but in 2011 was not significantly different from the position in 1999. Therefore our answer to those who worry about TUI’s influence on the market is that there is no argument that the group as a whole has any more influence now than 10 years ago. It is true that Crystal Holidays has become more dominant, with a 35% increase in their market share since TUI acquired First Choice. However, every industry has a market leader. Perhaps it is simply that they are more noticeable in a difficult selling environment. All our workings are based on the publicly available figures produced by Crystal Holidays. It should be noted that their calculations of Market Share represents only the Tour Operator market and excludes the Independent Travel and Schools sectors.